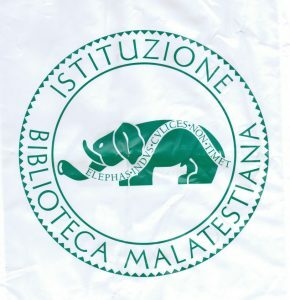 Perhaps the elephant who remembers everything, therefore, is the ideal symbol for a library. It happened also, in 15th century Italy, to be the symbol of the Malatesta clan which ruled Rimini and Cesena, where our Renaissance City tour will soon visit. The Tempio Malatestiana in Rimini is filled with elephants. But this post is about a library. Just before the middle of the century, the great sculptor Donatello’s one-time student and assistant, Michelozzo di Bartolomeo, was building the monastery of S. Marco in Florence. This gem is best known today for the wonderful Fra Angelico paintings but, architecturally, Michelozzo’s library was the great innovation, an elegant, long pillared hall with two side aisles. Only eight years later, in 1452, and much less well-known today, an equally important library was opened in the Malatesta city of Cesena. 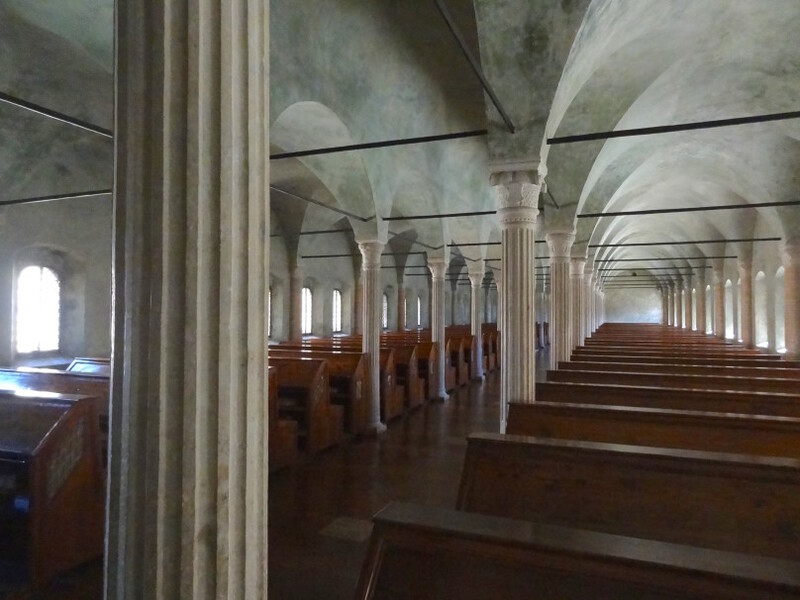 The form of this great reading hall is remarkably similar to its contemporary in Florence: a long barrel-vaulted central nave carried on columns and two side aisles of cross-vaulted bays. But the experience here today is quite different, in two ways. First, Biblioteca Malatestiana seems hardly to been touched in five and a half centuries. 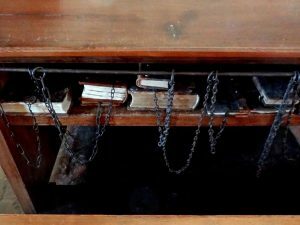 The two windows at the end of each bay provide good reading light, all 58 original rows of reading desks remain in place, with Malatesta arms carved on the end of each, the volumes on a shelf under each lectern are still today held with elegant wrought-iron chains. The ribbed columns are elegant and light, the walls and vaulting still retain shades of their original pale green wash. The end rose window illuminates the central nave and original tiled floor. It is a magical space. This possibility remains, partly, because of its second peculiarity: Biblioteca Malatestiana seems hardly noticed on today’s tourist trails. We have never seen more than one other visitor when we were there. It is, therefore, as wonderfully peaceful as it must have been centuries ago when built in the middle of a monastery. (It forms the upper floor of a long wing which stood between the monastery’s two cloisters.) 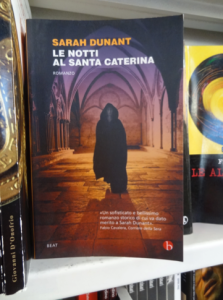 By contrast, its contemporary, the monastery of S. Marco in Florence today often overflows with visitors, and I have never seen the library without strong electrical light: this here in Cesena is a completely different experience. Moreover, unlike the slightly older S. Marco in Florence (which, I presume, must have been known to Matteo Nuti who designed this library), although it also was in a monastery it was not of the monastery. The lord of Cesena, Novello Malatesta, whose personal project this was, was very clear that this was to be a quite new, humanist project. He engaged the friars of S. Francesco in an agreement that their library would be rebuilt within the new concept of a library available to all the citizens. (All citizens, I presume, who could read and, moreover, read Latin.) Within the great reading hall, the books in the left aisle would be those of the fathers of the Church, those on the right would be the classics which in the later 15th century were being resurrected at a pace. It was, in a sense, a perfect built definition of what the word Renaissance, the rebirth of classical culture and its spirit of enquiry, really meant. 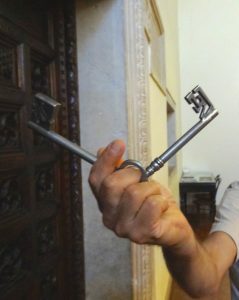 And to ensure that this dual spirit – the Christian and the Classical, the sacred and the secular, was held to, the great doors – which remain in place carved with the date 15th August 1454, 561 years ago to the day as I write this – have two locks, one key to be held by the abbot, the other by the city. Our visit to this hidden gem is one of the highlights of the Renaissance City tour next month. 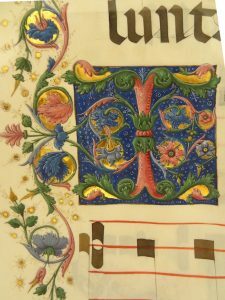 With the library, there was originally an important scriptorium where books were copied. 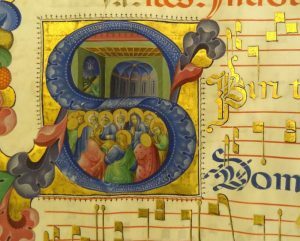 Here are two examples of illuminated initials among the many early music manuscripts on display today but not necessarily created here. We have been trying to think of reading which those who will be joining us on The Renaissance City tour in September might like to browse at leisure over the summer. And I’m sorry to say we were rather stumped. 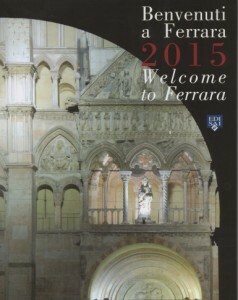 First, there are a few perfectly reasonable books about both Ferrara and Urbino, but sold as tourist guides only in the cities themselves (and there used to be some poor ones too, especially in Urbino; I illustrate two useful current Ferrara ones below). Second, at the other end, there is quite a clutch of highly specific academic studies on aspects of the Renaissance in both cities. 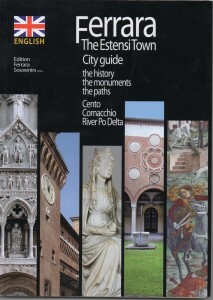 Of the 40 or so titles in my research notes on Ferrara, for example, two which stand out are C. M. Rosenberg (editor)’s The Court Cities of Northern Italy : Milan, Parma, Piacenza, Mantua, Ferrara, Bologna, Urbino, Pesaro, and Rimini, (2010) and T. Tuohy’s Herculean Ferrara: Ercole d’Este (1471–1505) and the Invention of a Ducal Capital (1996). For these, Amazon charges £140 and £105 respectively – though the latter has a paperback version, a snip at £50. Specialist interest – or university library – only! And third, of course, for general background reading the standard tourist guide books are probably as good as any – we use the Michelin and Lonely Planet guides, and often more interestingly, the Blue Guides. But, for the general and enquiring reader, there is very little in between. As the exception, therefore, we particularly commend June Osborne on Urbino (illustrated above left) which is not cheap, but still in print; fascinating, intelligent and beautifully illustrated. General reading about the Italian renaissance is always relevant and there are many books around thereon – browsing the library and bookshops is probably a good way to start. 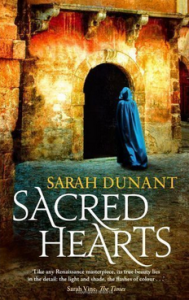 Let’s move quickly to fiction: Sarah Dunant’s Sacred Hearts (2010) is set entirely in one closed Ferrara convent, which the Sisters will open for us to see their unique, Giotto-esque frescoes. 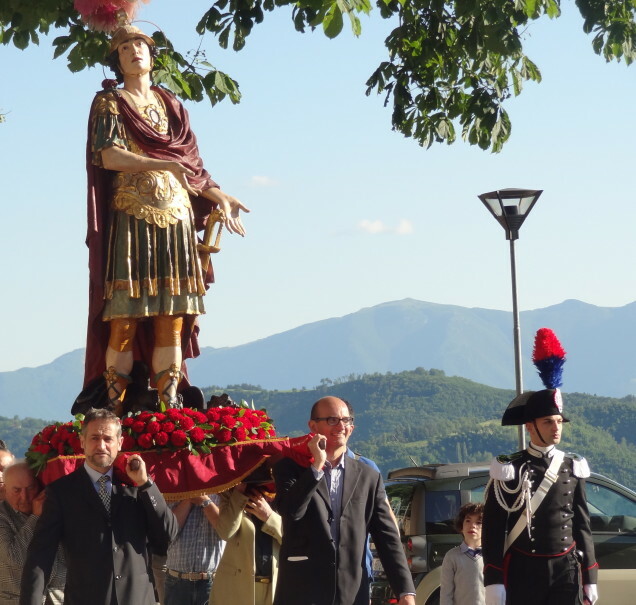 (It is also in Italian but, if you’d rather read that, perhaps you should be leading this tour!) 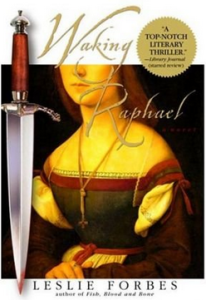 Leslie Forbes’ Waking Raphael (2004) is an intriguing thriller set in Urbino between the tempestuous 1930s and the Renaissance – its cover image is of Raphael’s La Muta, silence being a theme of the book. And Ali Smithi’s 2014 Booker-short-listed How to Be Both is interwoven with fluid subtlety with Palazzo Schifanoia in Ferrara. 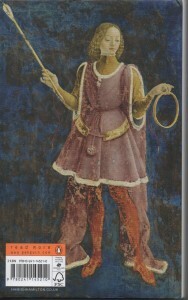 The back cover of her book – a figure from the amazing Hall of the Months in Palazzo Schifanoia – is the first image below. Introducing Ferrara in the Guardian, Dunant wrote in 2009 and Smith, quite differently in the same paper five years later, . 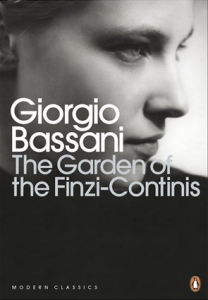 I would particularly recommend Smith’s article (and do look at the little essay in Frieze by Jan Verwoert on Schifanoia, to which her piece easily hyperlinks); I recommend it not least for her enthusiasm for Giorgio Bassani, Ferrara’s great 20th Century writer, whose most famous book, The Garden of the Finzi-Contini, was recreated by De Sica as a memorable Oscar winner in 1970. 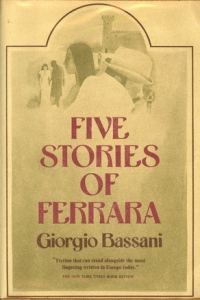 Sadly his Five Stories of Ferrara is less easy to find these days. 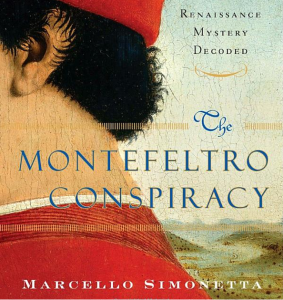 Finally, an unusual tale, The Montefeltro Conspiracy: A Renaissance Mystery Decoded by Marcello Simonetta (2008), although built around the famous Pazzi Conspiracy in Florence, accuses the man on the cover of being the arch-criminal. He is Duke Federigo da Montefeltro, his ear, curly black hair and red cap being cropped from Piero della Francesca’s famous portrait (now in the Uffizi). Piero was at Federigo’s Urbino court just as, some years later, Raphael met Baldesar Castiglione there, making the inimitable portrait (now in the Louvre) used on the cover (below right). 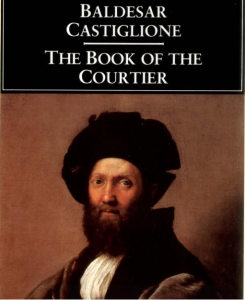 Castiglione’s The Book of the Courtier (Penguin Classics, trs George Bull 1976) is a unique and wonderfully readable panegyric on court life at Urbino. 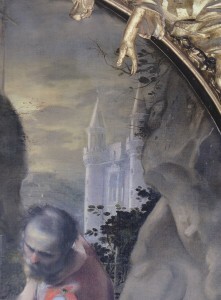 The central image above, a ghostly view of the Urbino Ducal Palace, is cropped from a religious painting by Urbino’s great Counter-Reformation painter, Federico Barocci, who was introduced to an astonished British public by a National Gallery exhibition in 2013. Well maybe after all there is quite a lot of potential reading, to suit all tastes, around these remarkable cities! A quarter of a century ago, the magazine Architecture Today, which had and still has a monthly column entitled “My kind of Town,” invited me to contribute. 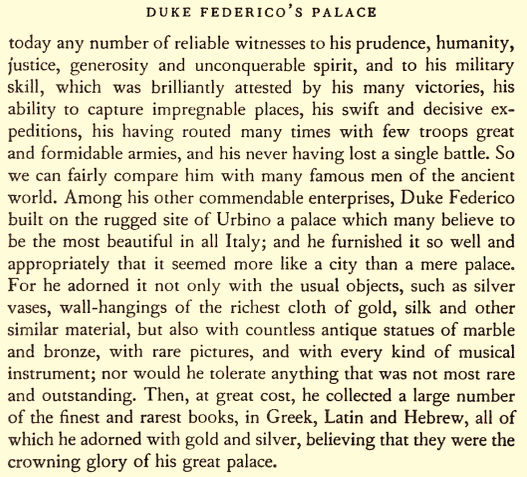 I wrote about Urbino. I would write rather differently today, but I still like that piece. (Click here to download). I worked, in the last quarter of the 20th Century with Giancarlo De Carlo who, as author of Urbino’s town plan, was more than anyone else responsible for the husbanding of its Renaissance heritage, but also with his friend Carlo Bo, rector of the Free University of Urbino, responsible for the construction of its unique 20th Century Renaissance. De Carlo’s 1960s study of Urbino’s past, present and proposals for its conservation into the future was Urbino The History of a City and Plans for its Development, MIT Press (1970) ; my study of De Carlo, his approach to the historic city and his new works was Giancarlo De Carlo: Layered Places, Axel Menges (2004, pages 52 to 113 are specifically about Urbino). Both of these are rather specialised. But a sample of how the new and old are interthought in Urbino, through one De Carlo university project, is described (click here) and can also be downloaded as a pdf. This ever popular tour based in Ferrara and Urbino is now fixed again for the end of September 2015, and is available for pre-booking now. 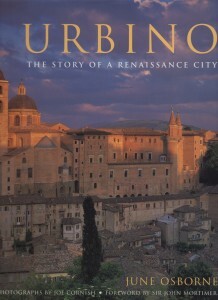 The two archetypal cities of the Renaissance are Urbino and Ferrara. Here, avoiding the crowds, we explore their unequalled buildings and artworks, Renaissance town planning and mediaeval monasteries – and of course their wonderful food and wine with three nights at the heart of each historic centre. John McKean may still not have completed his proposed guide book to Urbino but, guided by his intimate knowledge of both cities, the Cognoscenti travellers will have an unmatched experience.